Below we offer a more serious glimpse at witchcraft during Shakespeare's time. But for an entertaining warm-up, treat yourself to the witch scene from Monty Python and the Holy Grail on the Witches page of our website! 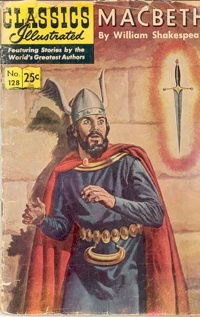 Shakespeare's Macbeth was written not long after King James VI of Scotland became James I of England in 1603, and James' interest in the subject of witchcraft undoubtedly influenced the play. James had become convinced of the danger of witchcraft when he sailed to Copenhagen in 1590 to marry Princess Anne, sister of the King of Denmark. During their return to Scotland, they experienced terrible storms and had to shelter in Norway for several weeks before continuing. The admiral of the escorting Danish fleet blamed the storm on witches. 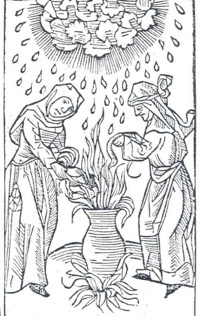 Several nobles of the Scottish court were implicated, and soon more than a hundred suspected witches in North Berwick in Scotland were arrested. James examined one of the accused, Agnes Sampson, himself. 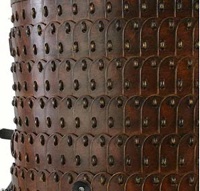 She refused to confess, so she was stripped, shaved, and examined until the devil's mark was found on her, then she was tortured anyway, attached to the wall of her cell by a "witch's bridle" (a metal torture device with sharp prongs which are forced into the mouth), and deprived of sleep. Finally she confessed, saying that a group of witches had come together on Halloween and plotted to work magic against the king. The confession led to many of the accused being burned, and to King James' great fear of witches. He wrote a book on the subject, Daemonologie, in 1597. Macbeth is one of the great tragic roles in all of theatre. So what does an actor think about when taking it on? 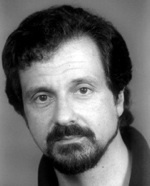 The role of Macbeth in our production will be played by ISC veteran Robert DeLuca, who answered a few questions about the process and the role. How do you prepare for a part like Macbeth? Muhammad Ali said, "The fight is won or lost far away from witnesses - behind the lines, in the gym and out there on the road, long before I dance under those lights." Preparation is key for any role, but for a role like this you have to be physically, vocally, textually, and emotionally ready to go the distance. Researching the world and yourself for real life examples of the core issues of a role to ground them in psychological truth for yourself is critical. At the same time one has to be cognizant of what contemporary lenses, psychological or otherwise, you may be looking through. Knowing where you are coming from is pretty important. Although I concur that right before you do a role, it is not a great idea to watch another performance of it, over past 8 years I have made it my business to travel to see other productions and some great contemporary actors do this role. Then you have to forget all that, and use what makes sense for you, your choices and the director's vision. I am pretty practical this way. I feel that the best preparation is entering the world of the play and doing it. After all preparations, I like what James Cagney said about the next part of the process: "Look the other guy in the eye and tell the truth." What do you want the audience to understand about Macbeth? The core of this is that a man (or woman) who is heroic in one context can, with the right set of circumstances, do terrible things if he follows his unbridled ambition rather than what he knows is right. This fall and error is what makes this play a tragedy, in the classical sense. A principal content challenge is to convey that Mac is not a sociopath, nor does he feel narcissistically entitled to the kingship. He never says one word about why he wants this, or that he believes he would be any better at it than Duncan (quite the opposite really), or how this would benefit him or that it is owed to him. He ponders deeply the choice to kill the king and decides against it, at least for a little while. He has a conscience and is then tormented by his actions. For me, the actor's challenge is to have the audience feel something for that struggle even as they abhor his actions. Also, for the audience to recognize in themselves, or those around them, the potential for poor choices and how they come about. You were last seen as Bottom in the ISC's production of A Midsummer Night's Dream. Which is harder, playing a comic character like Bottom or a dramatic one like Macbeth? Well, the old saying is that dying is easy, comedy is hard...but a role like this is challenging on so many levels. In comedy, there is an immediate relationship, and feedback system, with the audience. They laugh (in all its forms and levels) or they don't. In that sense it is unforgiving or greatly rewarding. It is technical in a very specific way. Timing is critical in a very precise way. Wait two seconds before you do a take to the audience, they laugh, wait one and they don't. You work those moments and then the audience teaches you what really does work. With a tragic role, you must go on subtler feelings and cues and trust the playwright, his poetry, the many choices made and the character's journey. You "feel" the audience with you or not, almost by the quality of the silences. In heightened language like Shakespeare's you are faced with the task of making the larger than life language and characters believable and truthful for the situation and gauge how far to take it before it becomes the wrong kind of melodrama. One of our goals on this production is to immerse the audience as fully as possible in the world of the play, and costuming will play a crucial role in this effort. 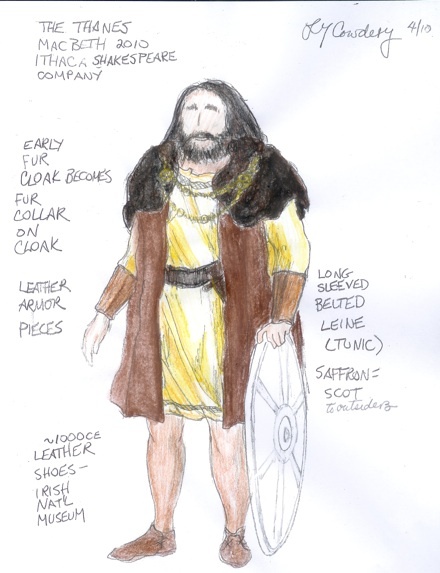 Our costumes will be designed to evoke the world of early Medieval Scotland in which these characters lived. 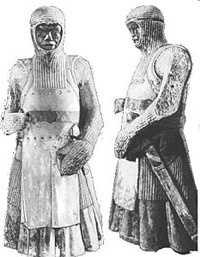 "We'd like the costumes to be influenced by whatever is known about Scots clothing around 1000 CE. There are few records, and all of them are verbal — telling us that cloth was generally dark, for example, and that warriors were bare-legged. Irishmen and Scots traveling in foreign countries were stereotyped not by plaid clothing (tartans began after Shakespeare died) but by saffron-colored tunic/shirts, called leines. That dye was mightily expensive, and only the rich used it — not surprising that it was the fashion choice of ambassadors or those with the means to travel abroad. Beyond that, we suppose that cloaks that once were all fur or all cloth become fur-collared cloth by the time they appear in images after 1300. Clothing historians are still puzzling out how cloaks were worn, but the most rational suggest that bulky cloaks were shed for battle, however they may have been festooned for day wear." The image above shows an early conceptual sketch for one of the thanes in the play, based on this research. To the left are a few images of chain maille and leather armor that Lauren will be drawing on for the battle scenes of the play. 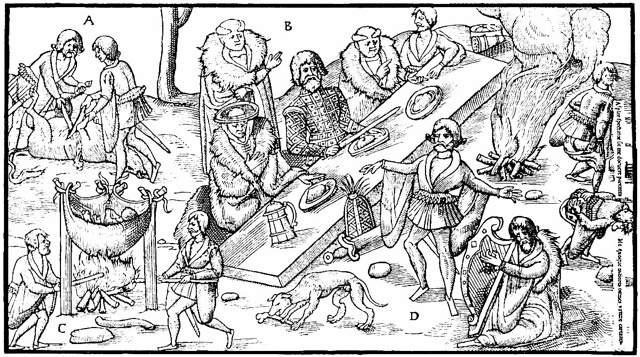 And at the bottom of this newsletter is a drawing from much later, 1578, of a Scottish clan chief being entertained at dinner. These and many other bits of historical research provide the raw material for costume ideas, which must then be filtered through the artistic sensibility of the designer and director — and, of course, adjusted to the pragmatic needs of actors in an outdoor theatre setting. Our last newsletter included images of a number of famous Shakespearean actors and actresses of the last several hundred years playing Macbeth and Lady Macbeth. How many of them could you identify? Answers (and some additional images) are posted here on our website! Is there a curse on the play?